How to Fish for Lake Trout: Catching lake trout is a fun and rewarding activity. Lake trout are native to North America but it has spread to other parts of the world as well. Lake trout is one of the most preferred game fish and people eagerly wait for the season to open. We hope this guide can help you get started with Lake Trout Fishing. Now, let us move to our lake trout fishing tips to help you learn how to fish for lake trout. But while focusing on catching trout do not forget to have some fun! The fun aspect of fishing is relaxing and enjoying a lazy day. Be alert and active once you hook the trout but do not be anxious all the time! Take a moment to relax and enjoy the day. When you plan on fishing for a particular species, it is advised you acquire some knowledge about it. It would help you decide on the type of bait you should use and the equipment that would be most suitable. So let us give you some important facts about lake trout. 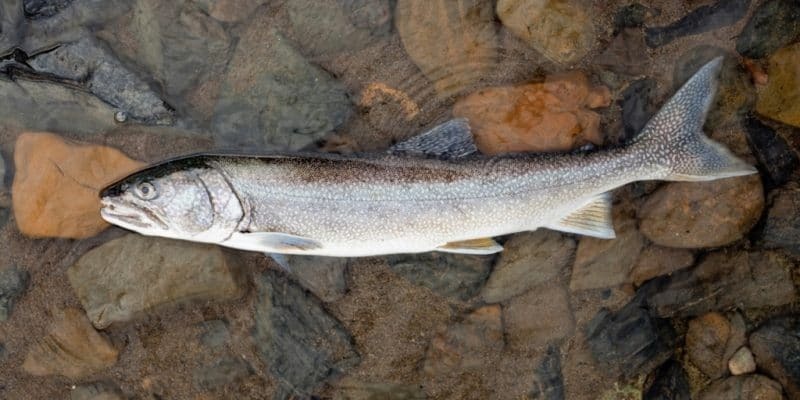 The scientific name of Lake trout is Salvelinus Namaycush but it is also commonly known as Grey Trout, Lake Char, Lean, Mackinaw, Paper Belly, Siscowet, Touladi, and Togue. Their favorite habitat is large lakes where there is cold water in the depths; hence the name Lake trout. Lake trout are one of the most popular fish among anglers in North America. They are native to cold oxygenated waters of North America, Canada, and Alaska. The average lifespan of Lake trout is about 25 years. Lake trout are dark green in color with pale yellow spots. The average length of Lake trout is around 130 cm. The heaviest recorded Lake trout weighed 46 kg. Lake Trout are daytime feeders and feed on small fish like whitefish, sculpin, and minnow. They also feed on aquatic insects and crayfish when young or when the food is scarce. They would eat insects like grasshoppers if they accidentally fall in the water. It is extremely popular among anglers as Lake trout is one of the healthiest fish to consume. It contains lots of vitamins and minerals, while at the same time, it has low levels of mercury. Like Salmon, trout lake is full of nutrition and vital minerals. 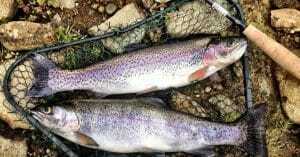 Throughout the world, people enjoy its taste and there are many trout farms as well. Wild lake trout, however, taste better than the farm-grown ones. Most equipment for fishing lake trout is the same as what can be used for any type of fish. But, there is some equipment that can be more convenient to use than others. E.g. there are two types of trout fishing rods you can use: the telescopic, extendable one or the one that can be taken apart. Their performance is the same but the ease of use and convenience is different. Other than that, you should know that the length of the rod is directly proportional to the distance of the cast. Choose the rod that is multipurpose and whose length is between 3-4 meters. The next piece of equipment to consider is the reel. For lake trout fishing, the reel should neither be too large nor too small. You also need to select a suitable line. For lake trout fishing, a 150-meter line is enough. We advise beginners to go for pre-rigged lines. If you are new to fishing then you need to know that bait is the lure that you use to attract fish to your line. Selection of bait depends upon the type of fish you plan to target. There are many types of baits and each one has its target fish. Knowing your target fish tremendously increases your success rate. If you are wondering what bait to use for lake trout, then you have many options to choose from. You can use either live or plastic baits for lake trout. Live baits tend to attract more fish than the plastic ones. Among live baits for trout, an earthworm is a good option but larvae also work amazingly well. When it comes to selecting lures, trout paste is an excellent choice especially at the beginning of the season. It is best to use fake larvae and worms in hot and cold weathers. The lake trout prefer to live in the dark deep water of a lake. Lake trout are readily available in large number in the cold dark depths of the lake. So, locating the depth is vital for knowing where you need to target. The depths in which you can find the trout changes with weather, season, and eating habits. Using a depth finder can help you avoid wasting time and effort in a wrong location and lets you enjoy a fruitful day instead of going empty-handed back home. We advise beginners to either jig or troll while fishing for lake trout. Jigging is a good and useful technique especially in areas where there are large numbers of trout available. Use a spoon jig or bucktail jig with live bait. All you need to do is to drop your line to the bottom and jig it to the top. This will easily lure in the lake trout to your bait. Jigging is the best technique if you are on a boat but other than that you do not need any special kind of line or rod or equipment. Just choose a light jig and good live bait for success. If your lake trout is not concentrated in one area, then troll for it. Trolling refers to moving about in the lake to locate a good spot for fishing. You can also wade in the water but by doing that you may not get far. You can troll from the shore as well because trout concentrate on drop-offs and ledges. It is colder in those areas and they can easily find food there. However, for trolling, you should use a depth finder and a fish finder. Move your boat to the center of the lake and use your fish finder and depth finder to work your way through to the fishing spot. After casting a line, you need to wait for the trout to bite it. You do not have to hold the rod all the time but be alert and active to know when the fish bit the bait. When the trout bite the bait, it will try to pull away. And when it does that, you will feel a tug at the rod. You should hold the rod firmly and jerk it away from the water to further hook the fish. The lake trout dives and pulls before it can finally be pulled out. So, hold the line steadily and strongly, resisting the trout’s effort to get away. Usually, the lake trout will dive three times before giving in. Diving is one of its tricks to get away. Keep moving the rod over your head till the trout is out of the water, take it off the hook and put it in your cooler or a bucket. You can also release the trout back if you do not want to keep it. When you get a fish hooked, the most important thing is to let the fish release its bladder in the water. The moment you see small bubbles coming to the surface of the water is the perfect moment for netting the fish. Another thing that you might hear (and it is a common and advised practice) is to keep the fish in the net if it is hooked by the lip. 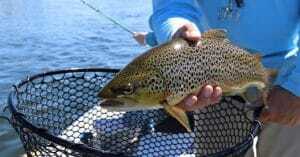 But since trout is an active vibrant fish, it will try to throw out the hook even in the net. If it is the first time that you are going on a Lake trout fishing trip, then we have some excellent tips for you. 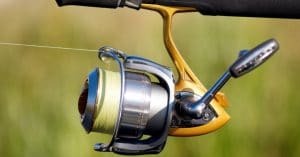 Whether you are fishing in shallow waters or jiggling in deep parts of a lake, these tips can help you make it an enjoyable and effortless day. If you are a part of any fishing club, then you may not have any problems. Most fishing clubs have group leaders who are experts lake fishing. Otherwise, try to go with an experienced friend to get a hang of lake trout fishing before going all alone. In the early season during April and May, lake trout prefer to move in shallow water and anglers prefer fishing from the shore. But as the season passes they shift to the deep waters of the lake. You may think that lake trout fishing in the rain is difficult, but you have a higher chance of catching a lake trout in the rain than in the dry weather. As a first-timer, you may think that catching a large trout is more exciting. And, it does give a sense of accomplishment! But if you want to keep the fish, then you should know that the smaller ones taste better. You should always wear gloves while unhooking the trout. Lake trout usually bleed when you unhook it. So do not worry if it bleeds but be sure to work quickly. If you do not want to keep the fish then unhook and release it head first into the water. Also, avoid holding the gills of the fish. You should know about the habitat the Lake trout enjoy and what they eat. You should also know which season is best for catching Lake trout. Before starting the expedition, do a survey about well-stocked lakes in your vicinity. I hope this guide was helpful and informative. If you liked it then please like and share it with your friends. Fishndans.com is a participant in the Amazon Services LLC Associates Program, an affiliate advertising program designed to provide a means for us to earn fees by linking to Amazon.com and affiliated sites.